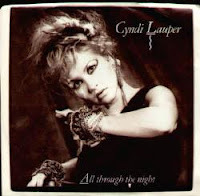 How about for the up late crowd we get some Cyndi Lauper in here? I actually was introduced to this song on a cd I picked up during my college tour back east. It was an acapella choir from Williams College, called the Ephlats, whose cd I believe I picked up because it looked the swankiest, and it was my introduction to college acapella as well as the reason I hear certain songs differently than most people seem to. I lost that cd several years ago and would so love to have it back.